Weekly Happenings: This past week was rather enjoyable. On Tuesday, we attended the National Night Out celebration at our neighborhood park. 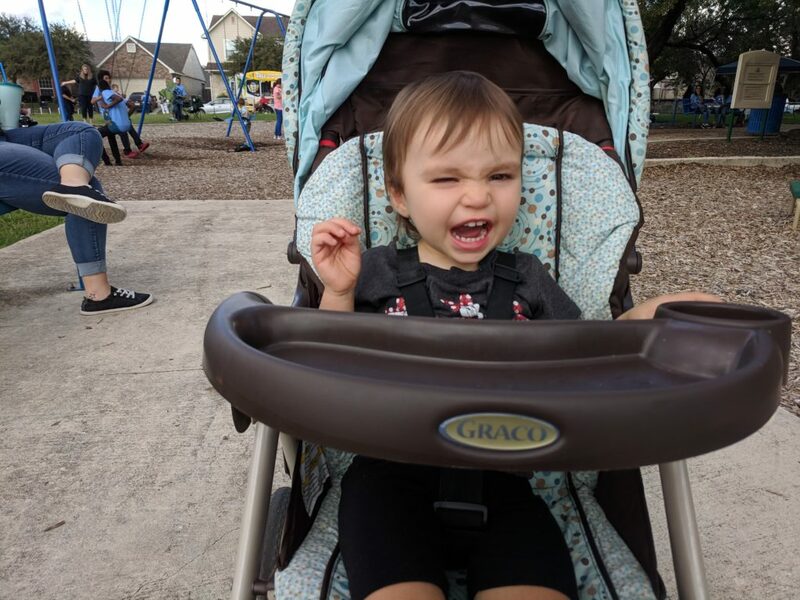 Joseph loved the bounce houses, Abigail liked looking at the petting zoo animals, and we all liked getting in touch with our neighbors and friends. Then on Wednesday, I got to go to a fun Relief Society activity. Aside from that, we filled the rest of our time with regular weekly things and some family time as well. The Weekly Weather: It’s been another week full of sunshine, rain, and rainbows. What Paul’s Been Up To: Mainly just work and his church calling. He has been spending some time working on a little free library that will be installed at the neighborhood park and will be stocked with books for people to borrow. What Sarah’s Been Up To: Not too much out of the ordinary on my front. I did get to be the “brave” person to kill a scorpion at the Relief Society Activity (it showed up as we were cleaning things up at the end of the night). I just stepped straight down on it, since I was wearing my boots. It was probably a quick and relatively painless death for it. What Joseph’s Been Up To: He enjoyed attending his first meeting with GT (gifted and talented). He said his favorite part was getting to pretend to be astronauts in training. Since this year celebrates the 60th anniversary for NASA, they are focusing on space, which I think is so cool. 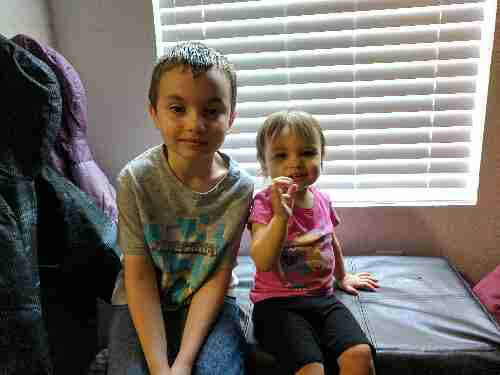 What Abigail’s Been Up To: She’s been fighting off a cold, but luckily she seems to be on the flip-side of it now. 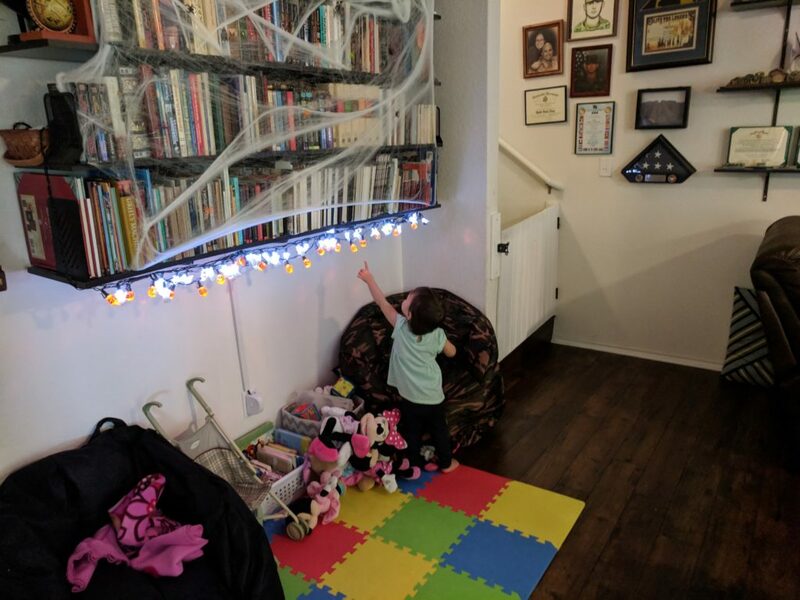 She really, really wanted to touch the lights. 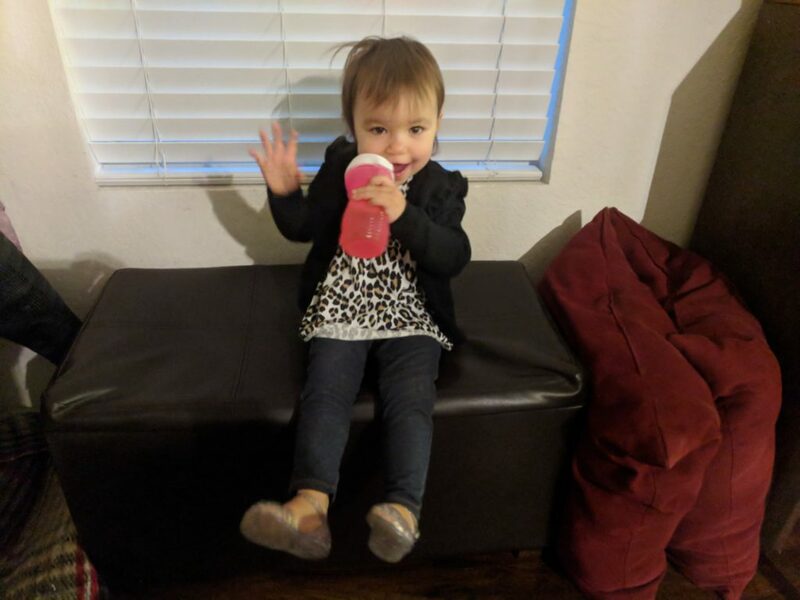 We would tell her no, but then she decided to take toys and try to touch them that way. We ended up taking them down since they were too much of a temptation. 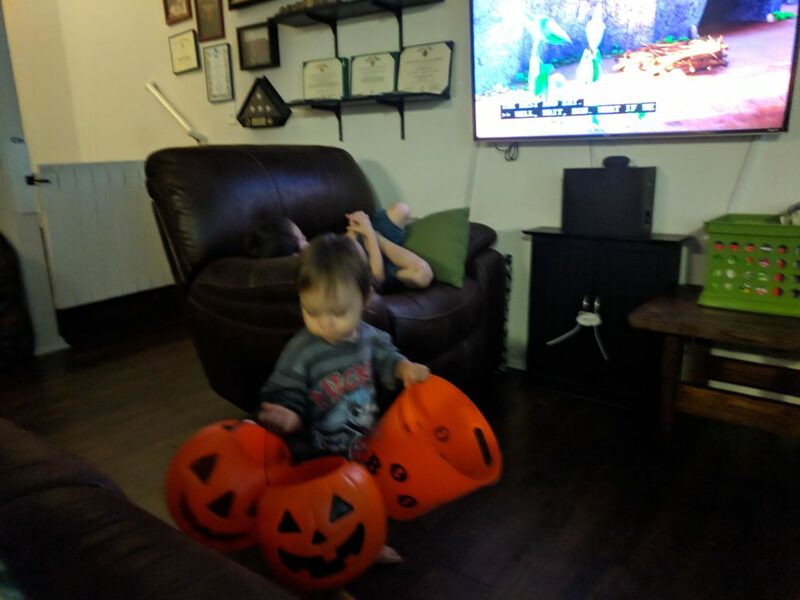 It’s blurry because she’s constantly on the move, but I love how she managed to get all of the Halloween buckets at once. 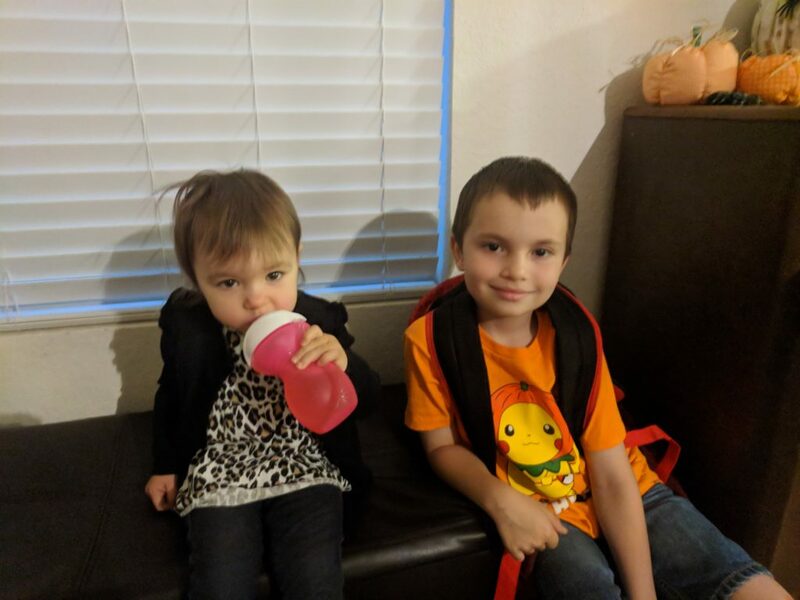 All ready to take Joseph to school on Monday. 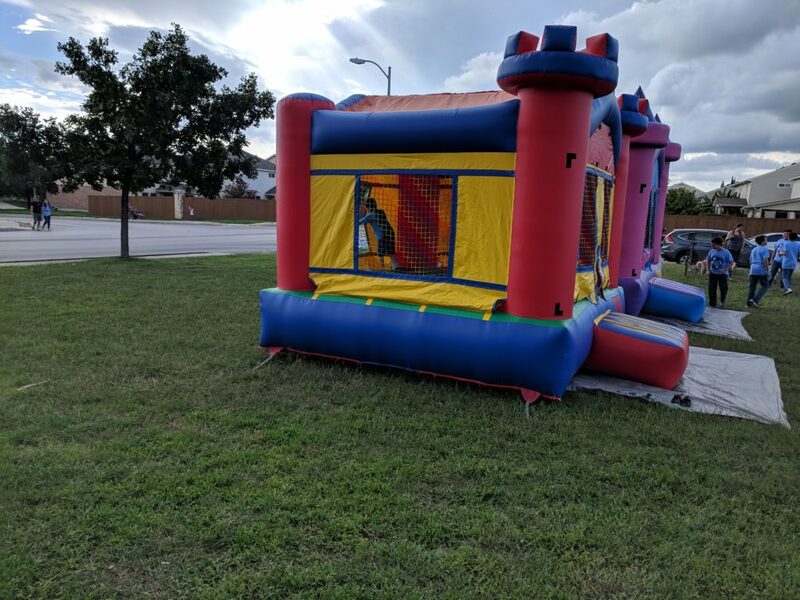 Joseph probably spent 90% of the time at National Night Out in these bounce houses. It looks like she’s growling, but she’s just in the middle of saying “hi”. 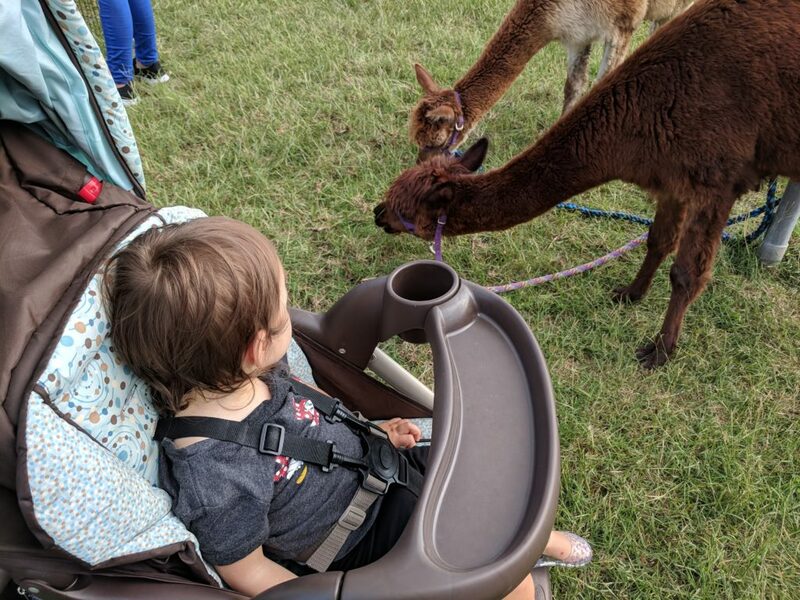 She really liked the alpacas. 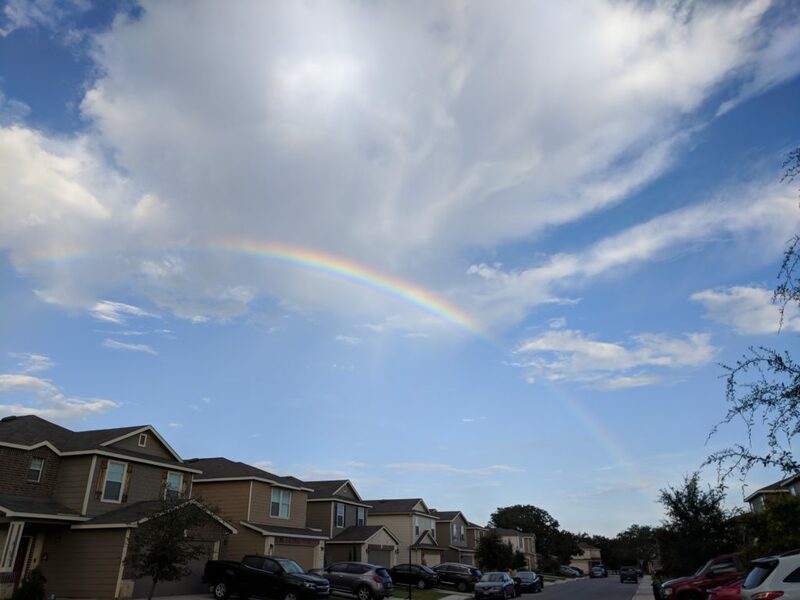 A pretty rainbow that appeared after the bit of rain right at the end of National Night Out. At the activity for Relief Society, part of the time was spent doing a favorite things exchange (you bring three identical things and go home with three different things). 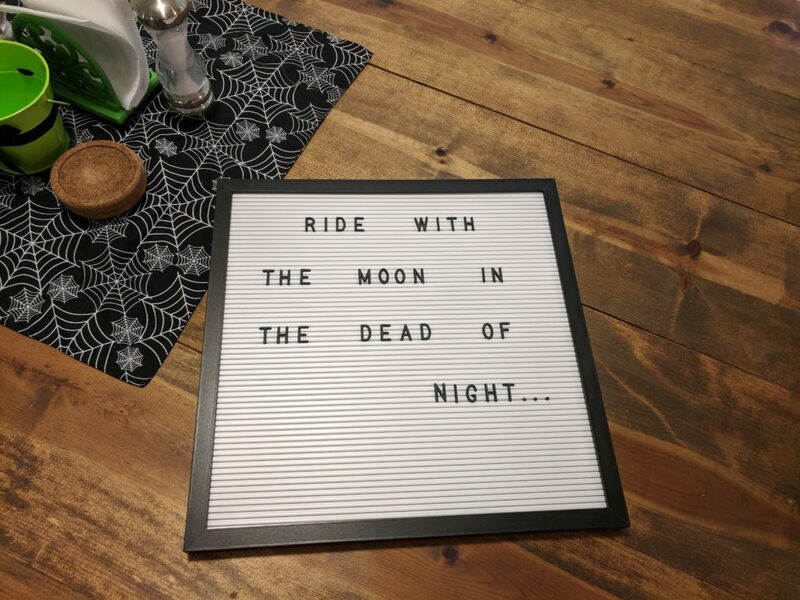 One of the things I came home with was this letter board. This is going to be fun to have around! 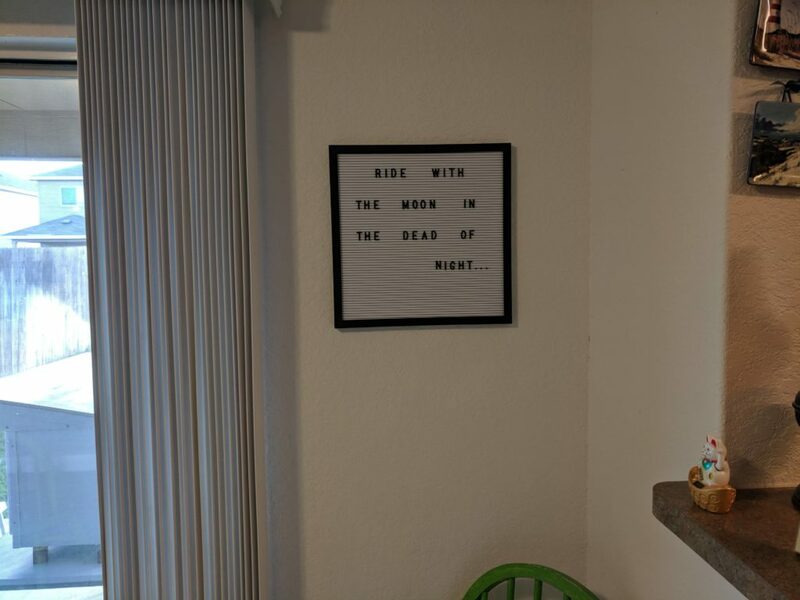 We hung up the sign in the dining room. 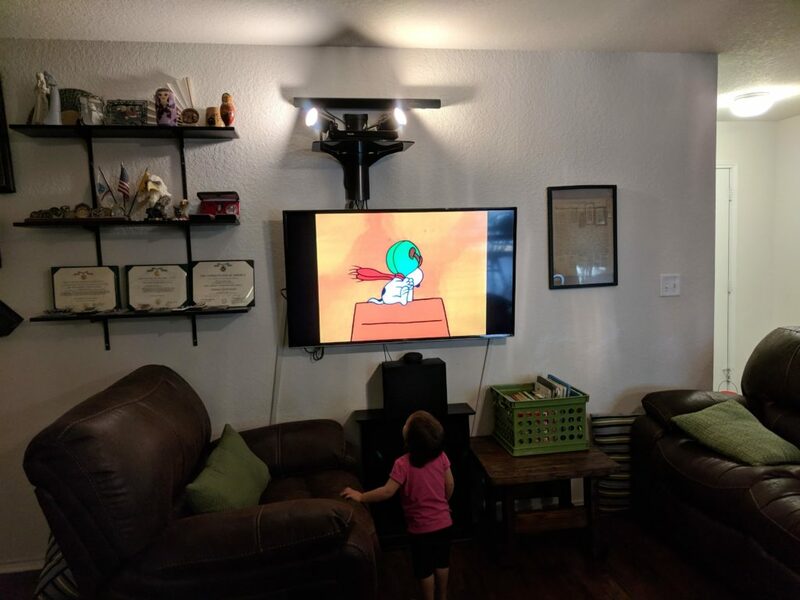 Getting introduced to It’s the Great Pumpkin, Charlie Brown. 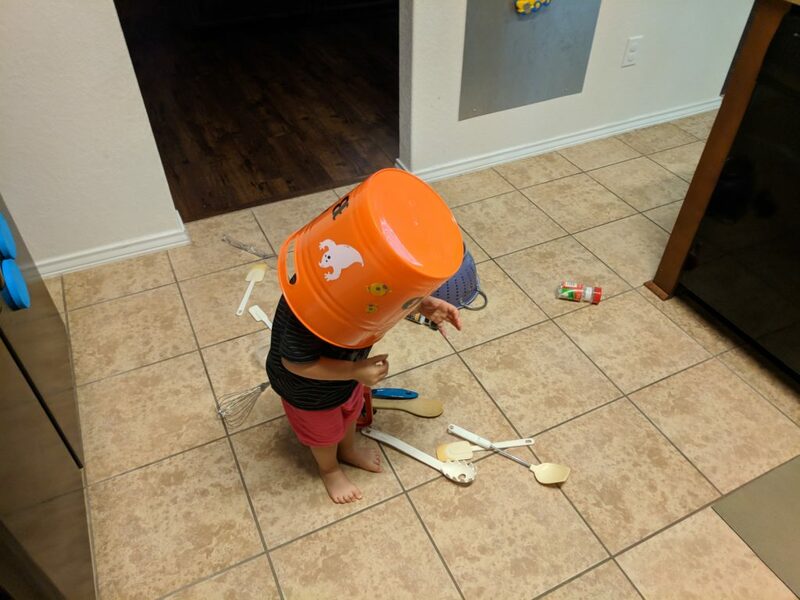 Life is always more…adventurous when you have a bucket on your head.